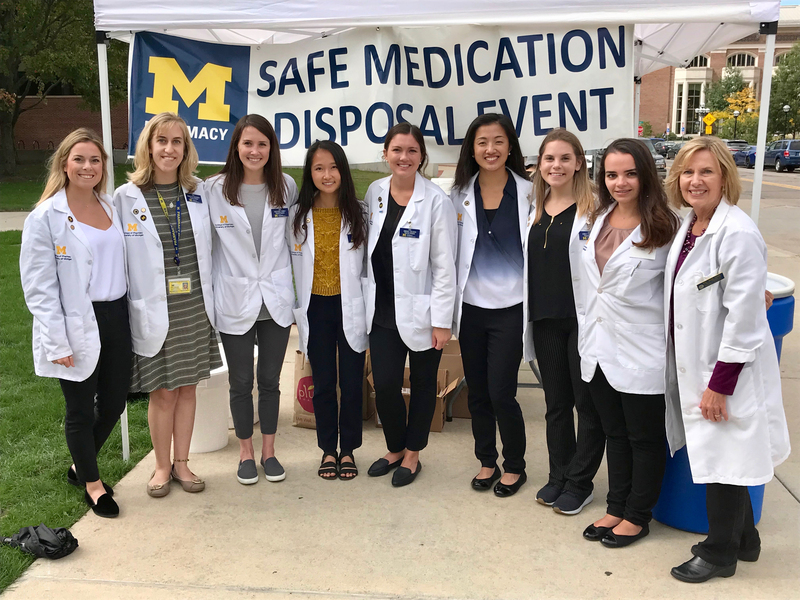 The University of Michigan College of Pharmacy hosted its 10th Safe Medication Disposal Event on Thursday, October 4. Students operated two collection locations simultaneously, on Ingalls Mall and at Michigan Medicine. The event was a collaboration between Phi Delta Chi, the American Pharmacists Association Academy of Student Pharmacists (APhA-ASP), and the University of Michigan Police Department, with sponsorship from Advanced Care Pharmacy Services. A record 501 pounds non-controlled and controlled medication were safely disposed of through incineration during the event. "This is an exciting event because there's a lot of enthusiasm from the students who volunteer their time. We hope this enthusiasm for patient safety and safe medication disposal continues long into our careers," said Rebekah Mahoney, PharmD’20, APhA-ASP’s Generation Rx Committee Co-Chair. Each Safe Medication Disposal Event has had considerable participation. Since the event's inception in March 2014, students have collected almost 3,500 pounds of medication that are no longer in homes, landfills, or the water supply. The event is primarily organized and run by student volunteers. The College would like to thank Sgt. Hicks and Sgt. Butzky, police officers from the University of Michigan Police Department, for their continued support of this event. Washtenaw County Water Resources Commissioner’s Office and Drug & Laboratory Disposal, Inc. helped with the disposal of the collected medications. Student volunteers collected and sorted medication, as well as educated the public on safe medication handling procedures. The College hosts two medication disposal events each year in April and October. Check the College of Pharmacy events page for information on future medication disposal events. For information on medication disposal resources available all year round, visit the College’s medication safety page.